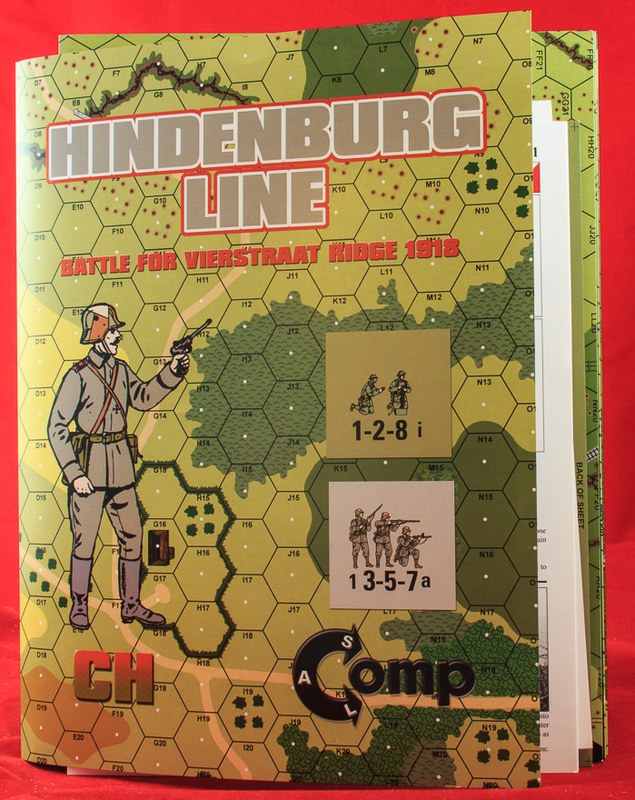 Hindenburg Line (hereinafter just HL) is a historical module designed for use with Critical Hit’s “GWASL” series, a misguided attempt to use ASL rules to simulate the extremely different combat of World War I. For an extended discussion of the GWASL rules, and their flaws, please see the write-up for GWASL1: Tankschreken! [sic]. 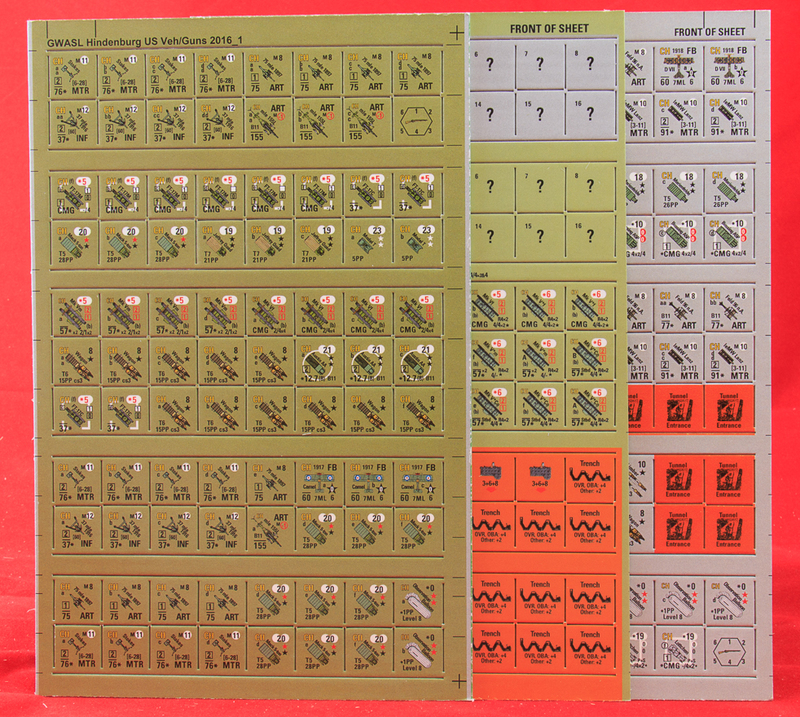 According to Critical Hit, ownership of GWASL I and GWASL III are both required to play this module (the first introduces the Germans; the other the Americans). HL simulates a battle in Belgium in September 1918 between the U.S. 27th Infantry Division and the 8th Prussian Infantry Division of the German Army for control of Vierstraat Ridge. The 27th Infantry Division was a National Guard Division, one of two (the other being the 30th) “loaned” to the British Army to fight in their sector; this battle was its first combat action. 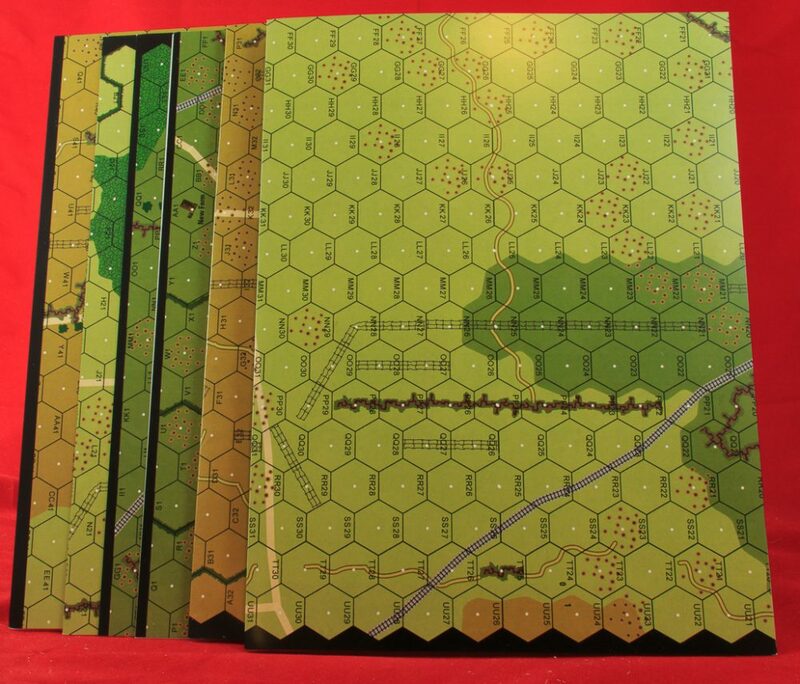 The historical map for HL is a dull affair, but that is more the nature of the terrain itself: the flat and open Belgian countryside. 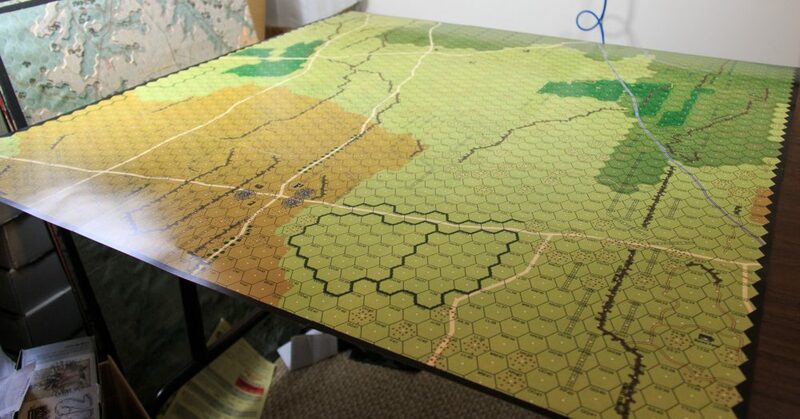 The map is comprised of 6 different map panels, each 12″ x 18″ in size, which must be assembled/mated in order to form the playing area. The map panels are glossy and printed on light cardstock/heavy paper stock. 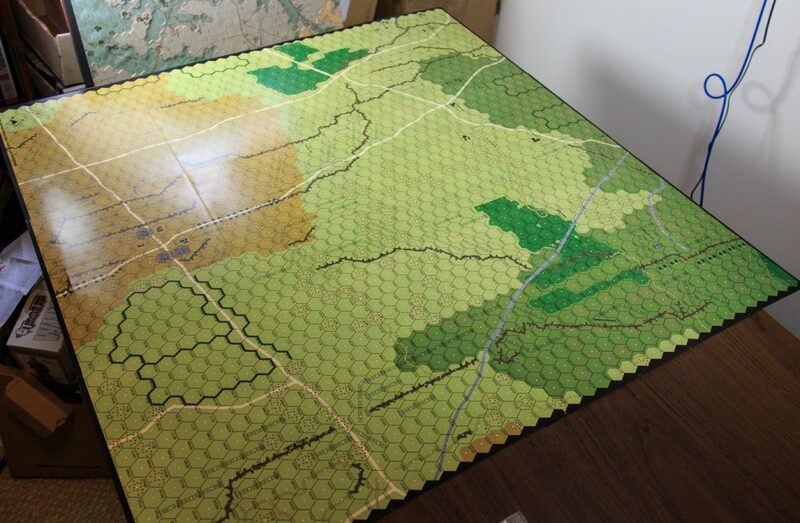 Experience has shown that assembling more than 4 of these map panels can be a pain; since there are 6 here, you can prepare yourself to feel accordingly irritated. The glossy paper creates glare under the lights but also makes map colors brighter. However, there’s not exactly a ton of color or variety in this particular map to begin with, so it’s not as much of a plus as it might be for other maps. 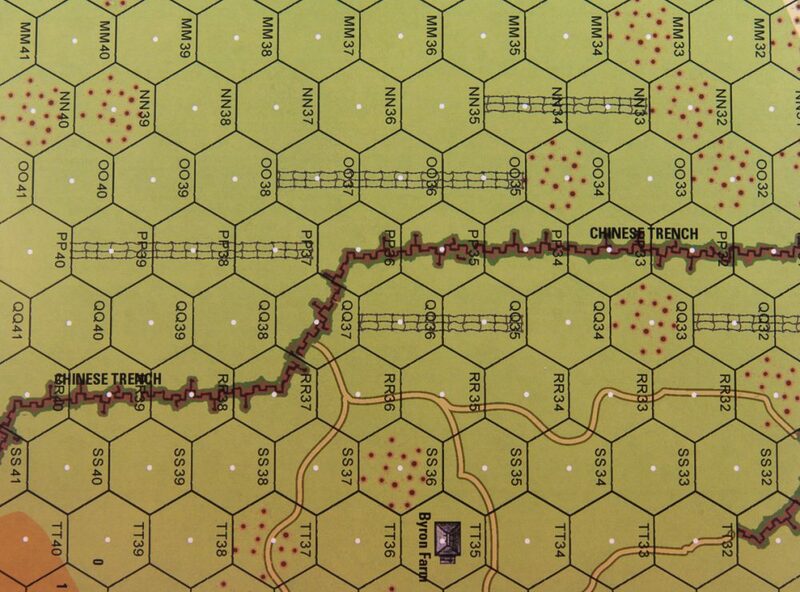 The most significant terrain on the map is man-made: scores of shellhole hexes, plus a wide variety of map-printed trench lines and stretches of wire. HL only has two pages of rules, which is not enough to give any particular flavor or sense to the battle; this makes HL a very generic historical module. 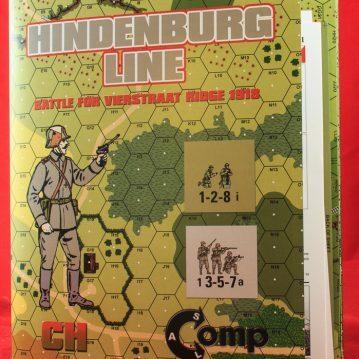 Or, as Critical Hit marketing spin puts it, “Unlike efforts by others, the aim to make a unique GWASL experience means no ‘menus’ and all that, instead you get the men and weapons, the ground, and they are set loose at their start lines to fight.” The few HL rules include a rule for Hindenburg Line Bunkers, very brief rules for trenches and on-map wire, a rule for Observation Balloons, and a rule for Pre-Assault Barrages and S.O.S. Barrages. There is also a vehicle note for the American Mark V* and V* Composite tank. Good luck making sense of this quite complicated vehicle. 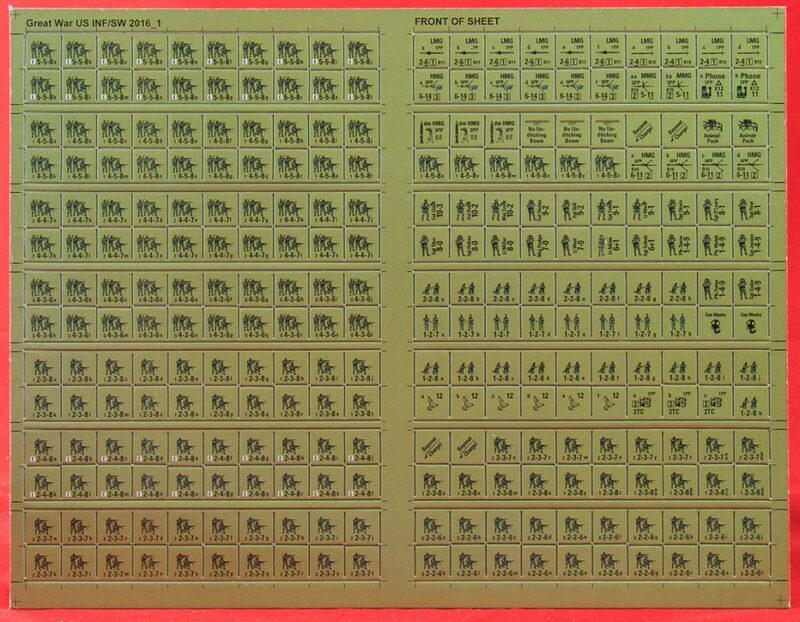 The module does come with a lot of counters–over 800, in fact–but a large part of this seems to be because of a particular decision by Critical Hit. Theoretically, almost all of the counters required to play this module should be found in GWASL I and III. 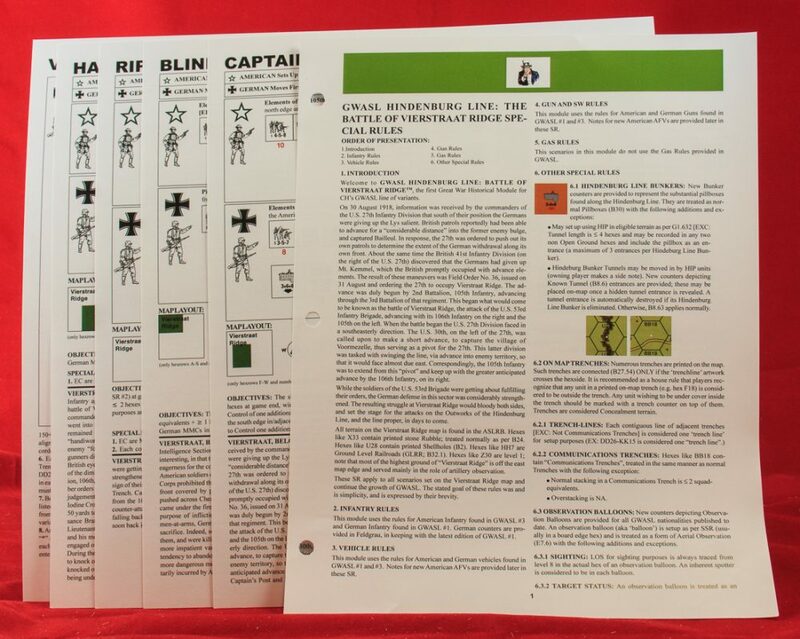 However, in this module, Critical Hit provides new American and German counters in an alternative color scheme. Instead of the normal greens and blues of these two nationalities in ASL, Critical Hit now provides the Americans in a dark Olive Drab green and the Germans in a light gray that it mistakenly terms “Feldgrau” (which is actually grey-green, but Critical Hit doesn’t know that). 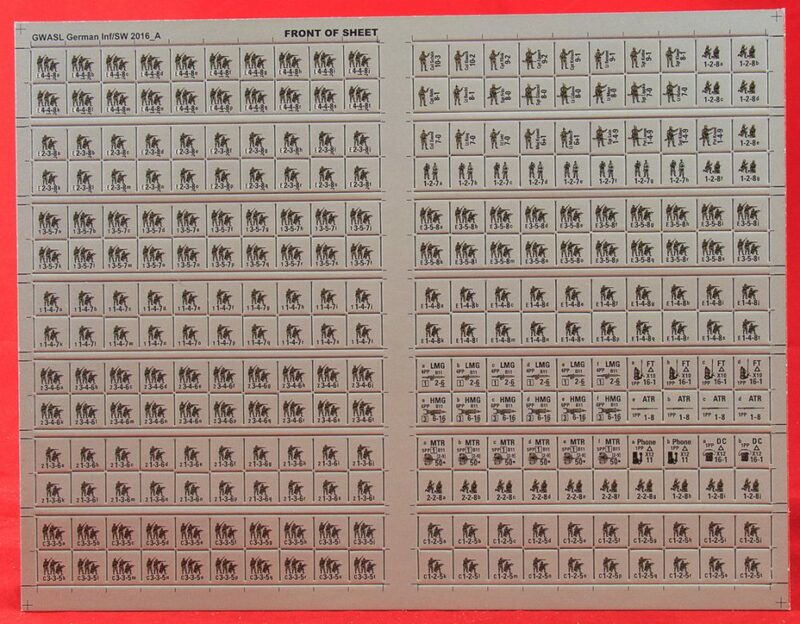 Critical Hit introduced these counters in some of its ASL products beginning in late 2016 and has for some reason been including them in its recent products. Unfortunately, both of these particular color schemes are ill chosen. The Olive Drab is drab but serviceable, but the dark shade chosen does not work well with the black-colored counter information. Critical Hit might have been better off printing the counters white on green. The German counters are perfectly readable, but boring. Light gray is as dull a color as one can possibly get, certainly inferior to the blue Germans of official ASL; moreover, there are already two gray-colored nationalities in ASL, though that doesn’t matter for this particular module. In any case, the counters are a bit disappointing as a result. Of course, people who have GWASL I and III can simply use those counters for most of the counters here, if they are so inclined. 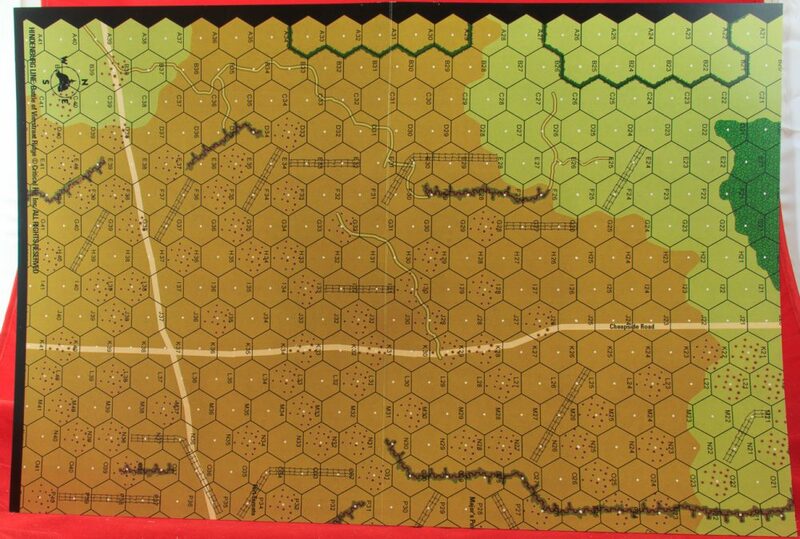 The countersheets provide American and German infantry and Guns, some airplanes, and a few AFVs, trucks and wagons. There are also some trench and pillbox markers in an interesting orange color. HL comes with 8 scenarios, almost all of which are large in size, as GWASL tends to have squad-heavy scenarios. Most of the scenarios are very simplistic, with two forces lined up across from each other, one of which will attack. Only one of the eight scenarios even has any reinforcements, so these are paint-by-numbers scenarios. Six of the eight scenarios have OBA. None use Night rules. Only one of them uses Air Support. 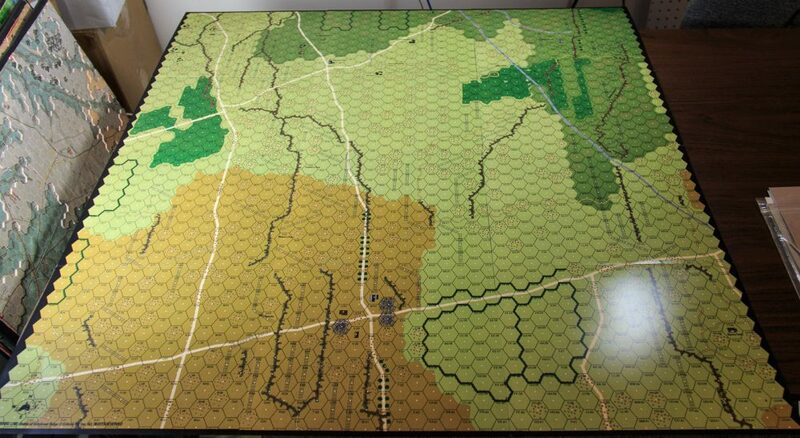 VR8 (Vierstraat Ridge) is the “monster” scenario included in the module. It is 54 turns long, which would tax anyone’s patience, and represents about a day and a half worth of combat. 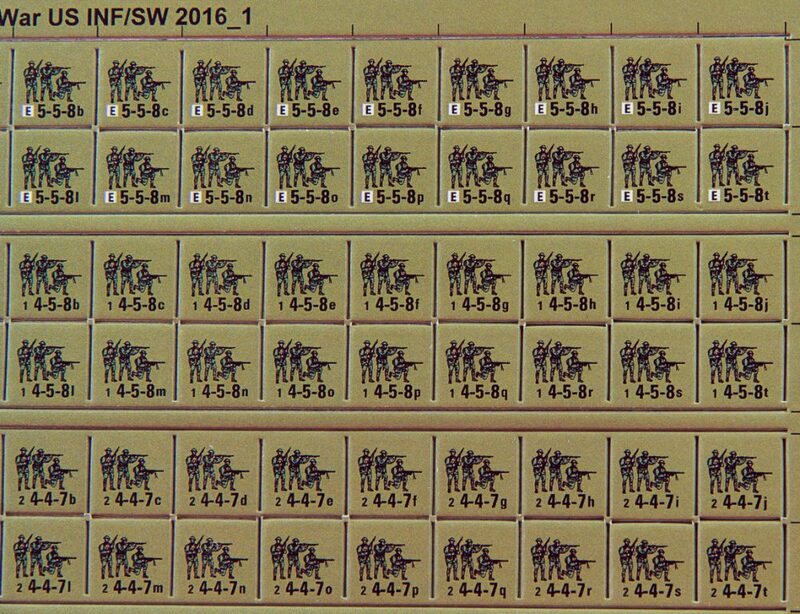 The U.S. player gets 58 squads and either 4 guns or 8 AFVs, if optional reinforcements are selected. The Germans have 66 squads, 9 Guns, a bunch of fortifications, and optional additional squads, AFVs or Air Support. A goofy SSR allows the American player to release Pigeons that may, if they make it off the map, bring in reinforcements taken from the dead pile. Other than this and the minor optional reinforcements that both players can get (at a cost in victory conditions), there are no reinforcements or replacements, so players start with a lot of units and basically throw them at each other for 54 turns; it would seem unlikely that they would survive long enough for the scenario to reach its final turn. Incidentally, no playtesters are listed at all. If players wanted to take this as a sign that the module was not playtested, they might not be amiss.